Axis Screenmount shelf – Studio White. 243 high x 600 wide x 300 deep, 4 x chromed bookend hoops, Arctic White powdercoat to brackets. Mounts on central transom of Axis screens. 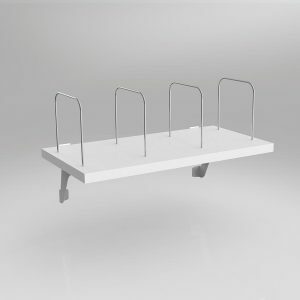 Aero Deskmount shelf – Studio White. 243 high x 600 wide x 300 deep, 4 x chromed bookend hoops, Arctic White powdercoat to brackets. Clamps over 25mm worktop. 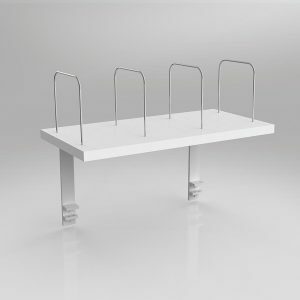 Axis/Anvil Deskmount shelf – Studio White. 243 high x 600 wide x 300 deep, 4 x chromed bookend hoops, Arctic White powdercoat to brackets.